So why when you open your eyes in the morning to nothing but a dismal morning, does your stress only get heavier and deeper? You draw in a soothing breath, not realizing the benefits swirling about in that one inhalation. What if you could tap into that energy and positivity upon waking? Now, please don’t mistake simple breathing workouts as some new age mumbo jumbo, or even think that you should just ignore it because you already know how to breathe! You know how to run, but can you run a marathon? Breathing exercises may sound like something from yoga class, but there are 6 exercises that can bring sunshine and warmth to every morning. How Do Breathing Exercises Work? This system is for the mellow, steady-state activity going on in your body constantly. When the PNS is moderated, the blood vessels dilate, the GI tract is stimulated, nutrients are absorbed, and the fight-or-flight response is mitigated. These breathing exercises all have a basis in mediation and yoga and you will start to notice the focus on counting as you go through them. Well, focusing on something other than the day ahead is a great way to actually begin your day relaxed! A novel thought I know, but it works! This is considered one of the most basic types of breath work – perfect for beginners who want an introduction to these types of exercises. You may find that you know it from a yoga class you took months ago. It is very simple and not too intense. Sit or lay comfortably on a flat surface, such as a yoga mat or on your bed. It doesn’t matter as long as your back is straight. Place one hand over your stomach, just below the ribcage, with the bottom edge of your hand (the pinky) resting over the navel. Place your second hand over your chest. Inhale deeply through the nostrils, trying expand the space beneath the bottom hand first. Your chest should not lift or expand in any way. Breathe out through your mouth. Purse your lips. Gently use the hand on your stomach to guide the abdominals inwards, pressing out the exhalation. Repeat this breathing 3 to 10 times. Remember to go slowly with the breath to get as much air in and out as possible. You might find that controlling the breath is harder than you think! Keep practicing. Also called “sama vritti,” this breathing practice works like counting sheep or muttering a calming mantra. You can do this one anywhere or anytime you need instant relaxation. To start, find a comfortable position for yourself. Close your eyes and notice your natural rhythm of breath. Do not change it at all. Begin to slowly count to four as you inhale. Find a moment of stillness when the lungs are completely full. Then count to four as you exhale. Take a moment to sit in the emptiness. Repeat this pattern, making the duration of the inhalations and exhalations equal. This is the perfect way to start the morning – even more effective than a shot of high quality espresso. Oftentimes, when you wake up in the morning, you are already primed for stress due to your body still thinking that it is in the year 25,000 BCE and expecting a sabre tooth tiger to pounce on you! Morning breathing will relax the body, minimizing tension that might have accumulated overnight. Stand up straight with the knees slightly bent. Bounce a few times, feeling the floor with the balls and soles of your feet. Begin to bend forward from the waist, hinging. Let the arms loose, hanging towards the floor. Take a deep breath in. Imagine yourself as an inflatable lawn ornament slowly rising up from the ground. Roll up through the spine, letting the head be the last thing to lift. As you exhale again, return to the bent over position. Repeat this flowing breath until all tension from the body is released and you feel a warmth moving through your limbs. This is a bit time consuming and thus should only be done when you have a break to devote to pure relaxation. Used together with simple belly breathing, this is a gateway to removing discomfort from various parts of your body. Lay down on your back, either on a yoga or pilates mat or the floor (if you have carpet). Close your eyes. Take a few normal breaths. Once you have established an even flow of breath, you may move onto the second part of the exercise. Relax your face by scrunching the nose and knitting the brows together. Release with the breath. Move on to the neck. Tilt the chin up and down, side-to-side. Shake your head yes and no. Then with the exhale, release. Relax your shoulders, shrugging them up towards the ears. Hold for a moment then release. Relax the torso by moving the limbs into an X form, stretching on in all positions. Stretch for several seconds then release. Lastly, relax the legs by pointing and flexing the toes as well as circling the ankles. Point, flex, stretch, and then release. Lay in silence for some time, once again returning to modulated breath. You may desire to repeat this process several times, paying special attention to the parts of your body that need more tension removed. Yoga classes often incorporate this type of pranayama into the beginning of the lesson. It is said to bring forth a sense of unwavering calmness and composure. Definitely worth a try when you are stressed over work or exams. Start in any meditative posture that has the spine in a long, straight, neutral position. As you breathe, hold the right thumb over the right nostril and inhale solely through the left. At the apex of the inhalation, you will switch to sealing off the left nostril with the right ring finger and open the right nostril. Continue the pattern for some time then switch the process. This is an involved, intense breathing practice that offers a challenge to those who may have mastered other exercises. You start seated on the floor with legs crossed or extended out in front of you. Begin with the simple breath work to regulate the pattern of the breath. Then, take a long, drawn out inhalation. At the end, contract the lower abdominals and sharply exhale. Do this several times to get comfortable with the contraction. Once you are comfortable with that, increase the tempo to sharp inhale, sharp exhale for 10 breaths total. Use only the nose. 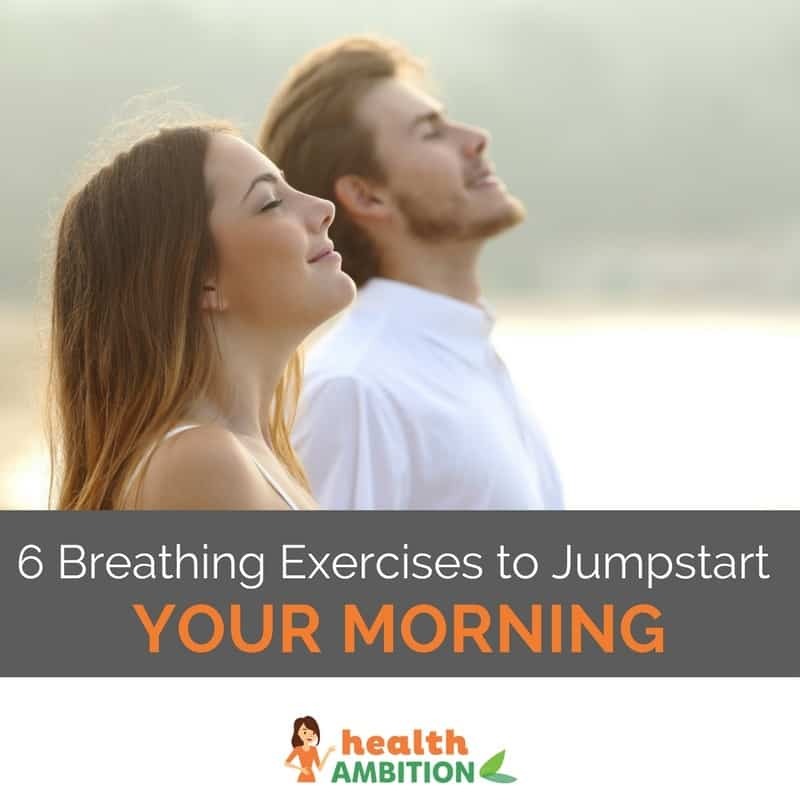 These six morning breathing exercises are not only relaxing, they shake off any lingering remnants of sleep. By doing this in the morning or whenever you are in a pinch for tranquility, you turn on the PNS, and regain control of your mind and body. Wake up, breathe, and get ready to tackle the day ahead of you.